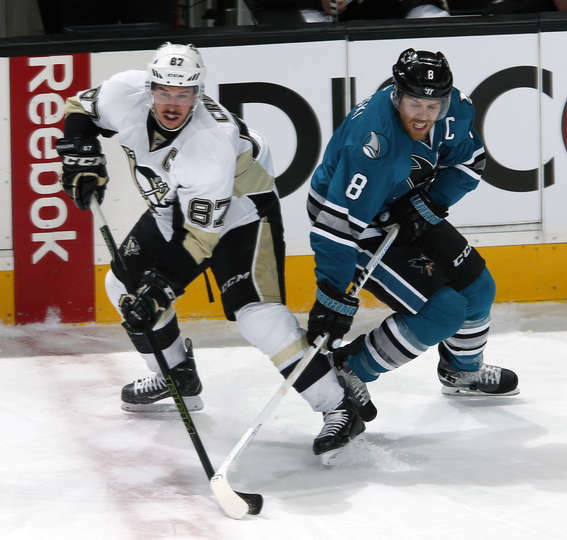 The Penguins enjoyed the home-ice advantage in building a 2-0 series lead over the Sharks in Pittsburgh. Now the Sharks will hope they can have similar success in San Jose. After a cross-country flight and a two night break the teams are back in action for Game 3. It'll be the first Stanley Cup Final game that San Jose has hosted, and they'll have to hope that a raucous home crowd gives them a leg up after struggling to deal with Pittsburgh's speed through the first two games. The Sharks will also need to deal with the loss of Tomas Hertl, who had been an effective third wheel on the top line with Joe Thornton and Joe Pavelski. Hertl did more than just become a trivia answer when he scored the Sharks' first goal of the series on the power play in Game 1. Hertl led the Sharks in Corsi differential through the first two games of the series with a +14, and that top line was the only one able to consistently drive possession. Mike Sullivan and the Pens were able to enjoy the last change at home to target the Sharks' third pairing of Roman Polak and Brenden Dillon, and it'll be noteworthy to see how Peter DeBoer chooses to match-up against Pittsburgh in Game 3. Of course, being able to choose the match-ups doesn't mean that he doesn't have to worry about having three strong scoring lines to worry about and only two defensive pairings who can match-up. Regardless of what he chooses, the Sharks are going to have a mismatch when the third pair is on the ice. They'll look to continue to get strong play from Martin Jones, who has posted a 0.930 SV% and 2.47 GAA through the first two games, allowing San Jose to play close enough to lose by a goal late. However, if he cant' keep up that high level of play, and regresses back towards the 0.918 SV% he managed in 65 regular season starts, then the Sharks will need to see a big swing in possession to get back into the series. - Matt Murray has responded since being benched in Game 5 of the Eastern Conference Finals, and the rookie has posted a 0.937 SV% and 1.48 GAA in his four starts since. - Conor Sheary has as well, posting 2 goals and 1 assist since also being benched in that Game 5, and he became the first rookie to score an overtime game winner in the Stanley Cup Finals in 30 years, when Brian Skrudland of the Montreal Canadiens did it in 1986.